Builders and Contractors Exchange wants to attract more candidates into the trades to address the critical workforce shortage in Hampton Roads. 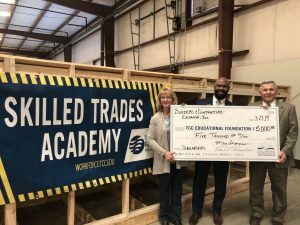 Tidewater Community College’s Educational Foundation is the recipient of a $5,000 gift from Builders & Contractors Exchange that will fund scholarships at the new Skilled Trades Academy in Portsmouth. The member-based organization that supports the regional construction industry wants to attract more candidates into the trades to address the critical workforce shortage in Hampton Roads, which anticipates 68 percent more job openings in skilled trades over the next five years than workers trained to fill them. TCC’s Skilled Trades Academy offers a wide range of high-demand skilled trades training in marine coating, pipefitting, pipe laying, welding, framing, electrical, HVAC, roofing and sheet metal. In many cases, training can be completed in six weeks for workers who find immediate employment. 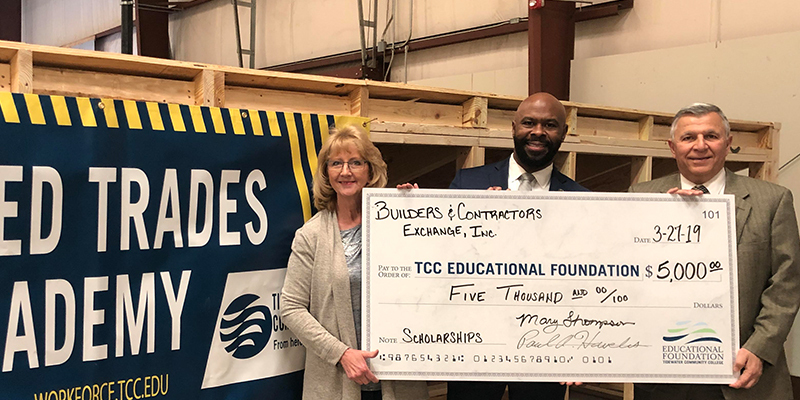 Paul Haveles, executive director of Norfolk-based Builders and Contractors Exchange, is hopeful that the scholarship money will pay off for his membership of 573, all commercial construction companies looking to sustain and grow their businesses and develop their employees. “Investing in scholarships is something tangible that we can give back to our members to help their businesses grow,” Haveles said. Nationwide, 31 million skilled trade jobs will be vacated by baby boomers by 2020. Mary Thompson, president of the Board of Directors for Builders and Contractors Exchange and vice president of Superior Marble & Stone, Inc., said encouraging young people to consider construction jobs must be a priority. The Skilled Trades Academy will host its inaugural open house and career fair on April 27 from 9 a.m.-noon. For more details visit tcc.edu/tradeskills, email wdinfo@tcc.edu or call 757-822-1234.